Institutional investors worldwide expect that the influences of technology, new entrants to the market and consolidation will significantly reshape the investment industry landscape by 2025, according to the most recent edition of the Fidelity® Global Institutional Investor Survey. The survey also found marked differences between institutional investors in different regions and the types of organizations they represent. 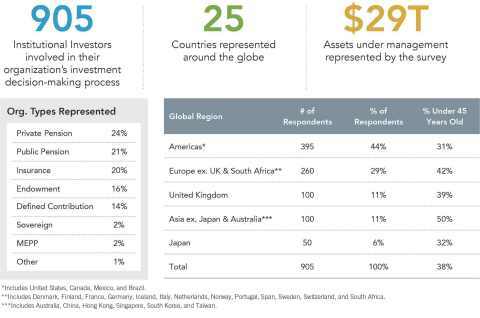 The survey is the largest of its kind, examining what's top-of-mind for institutional investors internationally. What's top-of-mind for institutional investors internationally (Graphic: Business Wire). Institutional investors expect that by 2025, markets and decision-making will be much more rapid, accurate and efficient with 62 percent believing that trading algorithms and sophisticated quantitative models will make markets more efficient and 80 percent believing that blockchain and similar technologies will fundamentally change the industry. The majority of respondents (75 percent) also say it is likely that non-financial technology firms will enter the industry, and those new entrants could cause some traditional firms to merge or be acquired as they compete with start-ups and fintech companies. Institutions recognize that the competitive landscape will likely also intensify as the investment industry continues to embrace AI. However, some institutions, particularly those in the United States, have not yet allocated resources to these technologies. Approximately one-third of institutions globally are not currently testing or considering how AI and advanced analytics may be useful to their investment process-and that number jumps to 77 percent in the U.S. Many institutional investors expect to rely on AI in the near future for capabilities including: asset allocation (69 percent), performance/risk evaluations (67 percent), and even creating custom portfolios (39 percent). "The transformation of the investment management industry is within our sights due to expanding data sets, faster computing power and smarter technologies," said Jeff Mitchell, chief investment officer, Fidelity Institutional Asset Managment®. "As investing becomes more transparent and real time, the implications for asset allocation and portfolio construction will be profound. Asset allocations will evolve as client needs become more complex, demanding more sophisticated and dynamic investment solutions. It's still early days, but predictive analytics will become a significant factor in the industry, so all institutions need to define their strategy." More than half (53 percent) of institutional investors believe that technology will replace traditional investment roles. Yet, many expressed the continued importance of the human connection with the majority of those surveyed (60 percent) believing that AI will augment jobs rather than replace them. Institutions will continue to value the expertise and insights their investment partners bring to the table, including non-investment perspectives on market psychology, emerging opportunities, strategy and problem-solving. Institutional investors also expect a transformation of the investment workplace as Millennials bring fresh ideas into the work environment, push for social change and move into senior roles. "When we arrive at the intersection of humans and machines, it's important to remember what is irreplaceable, and that is relationships," said Judy Marlinski, president of Fidelity Institutional Asset Management. "Asset managers who provide expertise and oversight will always be valuable to their clients, but they should also recognize that their expertise has to evolve toward leveraging new technologies that can help their clients effectively meet their needs and objectives." For additional details on the survey, go to go.fidelity.com/globalsurvey. Fidelity Institutional Asset Management® conducted the Fidelity Global Institutional Investor Survey of institutional investors in 2018, including 905 investors in 25 countries including pensions, insurance companies and financial institutions. Assets under management represented by respondents totaled more than USD$29 trillion. The surveys were executed in association with Strategic Insight, Inc. in North America and FT Remark, a Division of the Financial Times (News - Alert), in all other regions. CEOs, COOs, CFOs, and CIOs responded to an online questionnaire or telephone inquiry. Fidelity Institutional Asset Management® (FIAM®) is one of the largest organizations serving the U.S. institutional marketplace. It works with financial advisors and advisory firms, offering them resources to help investors plan and achieve their goals; it also works with institutions and consultants to meet their varying and custom investment needs. FIAM provides actionable strategies, enabling its clients to stand out in the marketplace, and is a gateway to Fidelity's original insight and diverse investment capabilities across equity, fixed income, high-income and global asset allocation. Fidelity Institutional Asset Management is a division of Fidelity Investments. Fidelity's mission is to inspire better futures and deliver better outcomes for the customers and businesses we serve. With assets under administration of $7.3 trillion, including managed assets of $2.6 trillion as of August 30, 2018, we focus on meeting the unique needs of a diverse set of customers: helping more than 28 million people invest their own life savings, 23,000 businesses manage employee benefit programs, as well as providing more than 13,000 financial advisory firms with investment and technology solutions to invest their own clients' money. Privately held for 70 years, Fidelity employs more than 40,000 associates who are focused on the long-term success of our customers. For more information about Fidelity Investments, visit https://www.fidelity.com/about. Products and services provided through Fidelity Institutional Asset Management® (FIAM®) to investment professionals, plan sponsors and institutional investors by Fidelity Investments Institutional Services Company, Inc., 500 Salem Street, Smithfield, RI 02917.